Lightning causes apartment fire in Greenbelt, Md. GREENBELT, Md. 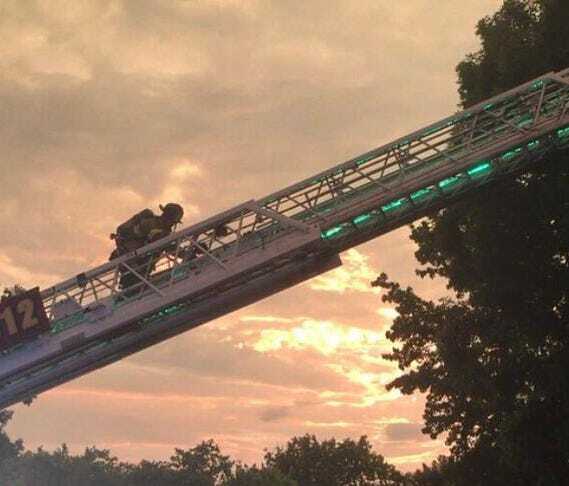 (WUSA9) -- Thirty six people were displaced after lightning from Tuesday's storm caused an apartment building to catch fire in Greenbelt, Md., according to Prince George's County fire officials. Firefighters responded to the 200 block of Lakeside Drive at approximately 7:35 p.m. Tuesday for the report of a fire on the roof of an apartment building, fire officials said. In all, 66 firefighters worked to put out the flames. No one was injured, but people living in 22 different apartments were told they couldn't go home. A man who spoke with WUSA said he lives in one of those apartments. He said he felt the apartment shake and heard a "boom." All of the power went out, but he didn't realize the apartment was on fire until neighbors beat on his door. Nucleo Vega lives in the adjacent apartment building. He was watching television when he heard the explosion. "All you just saw was a flash of white light," said Vega. "You couldn't see anything." Vega and his family assumed lightening struck a tree, but when they looked outside they started to see puffs of smoke coming from the roof and after about a minute, they saw flames. Person dead after tree and wires fall on car in Md.